ADA seems to have refined and narrowed its AMCA powerplant options. The 25-tonne class AMCA is to be fitted with a 110-kN engine. However, currently no 110-kN class engine is available in the world market. So ADA will design the fighter around a 110-kN engine, but use a 90-kN off-the-shelf engine to power prototypes of the aircraft, giving itself time to develop a 110-kN engine. ADA Director PS Subramanyam told The Hindu that it would be prudent to procure and integrate an available 90-kN engine into the aircraft so to ensure that the project was not held up. “Since the fighter has been designed to take on an engine with a higher thrust, we can integrate it as and when such an engine is available. This is what has been done by Dassault in the Rafael development program,” he says. Elaborating on AMCA powerplant options, K. Tamilmani, Director-General (Aero R&D) told the press that since no 110-kN engine is available off the shelf, GTRE will partner with a US or Russian engine manufacturer to develop such an engine - mostly within India - to power AMCA production variants. “We have asked for their proposals [and will go ahead with] whoever has a better offer, time frame and cost," he said. The goal is to integrate the new engine into the aircraft by 2020-21. 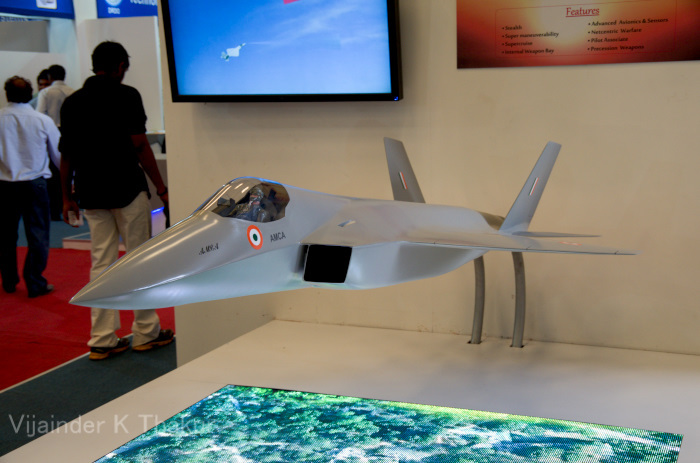 DRDO and IAF officials will hold talks with two manufacturers during Aero India 2015 - General Electric of US and Klimo of Russia. Interestingly, Tamilmani didn't mention French Snecma and early front runner for co-producing an AMCA engine with GTRE. It was earlier reported that the AMCA will be powered by a new engine that GTRE plans to develop with the help of one or more foreign consultants, Snecma being one of them. On January 8, 2015 the TOI reported that five to six global aero-engine manufacturers have made presentation to ADA for the AMCA engine. It is likely that ADA has now narrowed down its options based on the presentations. IDP Sentinel members can read more about the AMCA project at the link below.